Decatur Township, IN, is filled with attractions that can ensure fun for everyone in the family. To explore the city for yourself, you’ll need a reliable car which is where our Toyota dealer Decatur, IN, can help. As a full-service dealership, Andy Mohr Toyota can provide all the options and services you need to make finding your next new car easier and much more enjoyable. Read on for more information about our dealership and the Decatur Twp. community. Decatur Twp., IN, is a small city located in Adams County. Thanks to its friendly communities, it has attracted more than 9,000 residents. But the thing that really makes this city special is its attractions. In Decatur Township, you’ll find everything from local business and shops to great eateries. The city is also known for its annual events that provide fun and excitement everyone. Grab some fresh produce at the seasonal Farmer’s Markets or take your kids to any of the parades around town. Though small, there’s always an endless list of things to do in this vibrant city. When you’re ready to explore it, visit our Toyota dealer near Decatur Township, IN, and we’ll get you behind the wheel of the dependable Toyota you need. Everyone needs a reliable car, especially if you want to check out all the fun-filled attractions around the Decatur Township area. Luckily, finding the right model is simple with help from our dealership. Our local Toyota dealer is home to every new Toyota model on the market. 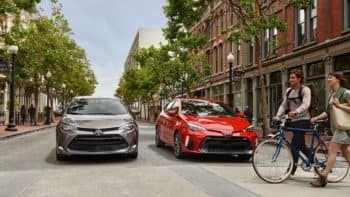 If you want a sporty sedan with excellent fuel economy, the Camry and Corolla are great options. If you require something that’s designed to take on various weather conditions and terrain, our Toyota trucks like the Tacoma and Toyota SUVs like the Highlander may be best for you. If you’re in the market for a pre-owned option that’s just as dependable and well-equipped as our Toyota vehicles, feel free to check out our used and certified pre-owned cars. There is a lot to choose from at our Toyota dealer, but we’re here to help you make your car buying decision easier. Our team is trained on all things Toyota, so when you want to learn more about a specific vehicle and the performance and features it offers, just let us know. Plus, if you want help choosing the right model for your lifestyle, we’ll schedule a test drive for any vehicle you’re considering so you can experience it for yourself. Once you’re behind the wheel, you’ll be able to see clearly which car is best for you. At our Toyota dealer near Decatur Twp., IN, you’ll find more than just an impressive selection of vehicles. You’ll also get two departments dedicated to helping you drive home and care for your new car. In our finance department, you’ll find our finance staff. They have tons of experience and have established connections with many different banks and lenders to help you get the ideal finance plan you need for your next new car. Interested in leasing? We’ll be able to assist with that, too. Long after you’ve driven off our lot in your new car, we’ll still be here to make sure it performs at its best for years to come. In our service department, we’ll use advanced technologies and high-quality parts to preserve the excellent condition of your Toyota. And since every technician at our dealership has extensive training and experience in the automotive industry, they can give your car impressive services and repairs and have it back on the road in no time.